1. Remove the hatch cover. Pull on the two handles at the forward edge of the seat bottom. This will unlatch it so you can lift out the whole seat bottom. Remove the left side rear seatback, by undoing the two 12-mm bolts, which are at its base. Unscrew the rearmost screw on the scuff plate (the plastic strip that sits over the rocker panel.) Unscrew the single screw on the cover over the rear seatbelt retractor, and lift off this cover. Remove all the screws holding on the large panel. The only tricky part is getting to the two screws at the rear seatbelt retractor - there is not much space, so you will need a short screwdriver. I used a long Phillips screwdriver bit with a socket and it was easy. You don't need to take off any seatbelts - just let the panel hang with the seatbelt still through it. 4. The receiver is the large box forward of the speaker. There is a 3-position switch on it marked SET 1 - FIX - SET 2. You will find it easier to access this switch if you remove the receiver from the car body. Move the switch to either SET position (the two SET positions are in case you have two transmitters with different codes), so that the receiver will learn the new code. Press either button on the new transmitter. Move the switch back to FIX, to retain the code. Test the new remote operation - it should work. Is There An Aftermarket Alternative...? Question: If nobody knows where to get parts for the keyless entry, how about getting a new one? 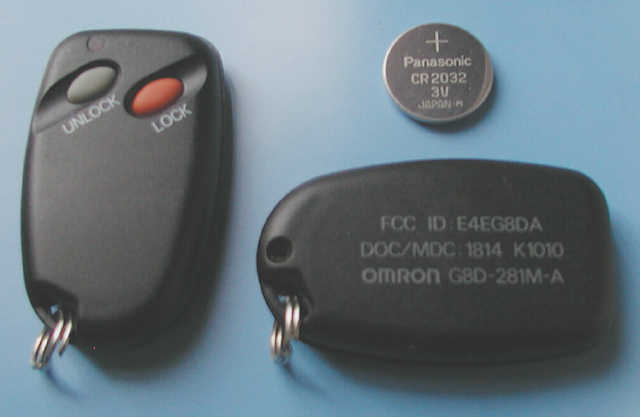 Reply: I've found it very hard to locate new, or even used, keyless entry remotes for my 2nd gen. So we're in the same boat. I see 1st gen ones on eBay and parts forums every once in a while, but never 2nd gen ones. Bummer, cause I'd love to be able to use the keyless entry. I did hear that you could get them from a dealer new, but they ran like $80. I'm not paying that. Does anyone else have any ideas on this? Reply: How about aftermarket [keyless entry remotes]?? Reply: Wouldn't that effect the factory security system? Well, maybe not. I guess as long as the door gets unlocked, that's all the security system/alarm is looking for. Or is the fact that the key is inserted and does it? I guess I'd have to go back to the user's manual, cause for some reason I think that an aftermarket system would not "unarm" the factory security system like a factory keyless entry would. Again, it might just be the fact the door locks physically. If that's the case, I suppose aftermarket would be OK. I just didn't want to have to deal with disabling the factory stuff and putting on a full aftermarket alarm. I don't see the point in a stand-alone aftermarket keyless entry solution. Reply: I got a keyless entry / remote starter for [something] like $60. It still arms and disarms the factory stuff, I think I just had to tap the wire that the stock keyless entry unit uses. It is extremely useful for several reasons - 1) I don't care about the silly factory remotes anymore. 2) I now have remote start. 3) The system works from almost 1/4 mile away instead of almost 1/4 of a yard. And yes, it is a 6-speed, and yes, I did say remote start. Reply: That sounds pretty promising Brian. Does this unit also serve as an alarm? Do you happen to use a turbo timer? I'm wondering what effect that would have on the alarm features. I can search on that. What brand/model is the unit you put on your car? Reply: I got it from www.12voltdirect.com. I think it was the CS324. It has a jumper you remove to set the thing up for remote start of a manual transmission vehicle. It took me a while to find all the right wires and such, but once I got it all setup it was pretty nice. And I do use a turbo timer, they don't interfere with each other at all. The one I got does not have its own alarm, it only utilizes the factory unit. They have some others on there that come with an alarm, but I haven't tried any of them. Reply: I have an aftermarket alarm on my '93 Stealth TT, because when I bought it, it did not come with the factory remotes. I have an AutoPage RF-7000 alarm, and did not disable the factory security system. The two do not interfere as long as I wait until the doors are closed before I arm the alarm. If I arm the alarm while the door is closing and it locks before it's closed, then both alarms are armed. When I disarm the AutoPage using the remote, it unlocks the door, but since the door key switch is not used, the factory alarm does not disarm and therefore the factory alarm goes off. I have to close the door and unlock it with the key to disarm it then. I rarely make this mistake, so I haven't investigated how to prevent it yet. Maybe that will be something willI look at this weekend.